We all know that stress is an inevitable part of life. Stress stems from various sources, and it also comes from the pressures we place on ourselves. We stress over trying to achieve our desire to maintain a set lifestyle, high standards, and all the luxuries we want. For this, we may take loans and EMI payments as an option thinking that we can start enjoying life now, while not realizing that this also adds to additional stress in our lives. We may want a luxurious life, but knowing the difference between what you ‘need’ and what you ‘want’ can make your life happier and stress free. Simply Put: A Need is something you have to have and want is something you would like to have. There is sometimes a very fine line between the two and sometimes it’s very obvious, but one thing is for sure, we all have different opinions on what is a need and what is a want. Clothing is a need- we may all agree, but the place where you buy that clothing from is debatable as a want or a need. Identifying needs and wants and delaying those wants until you can truly afford them is all about saving yourself from the stress of loans and EMIs. 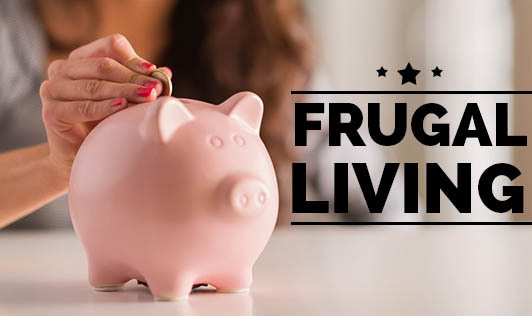 Frugal living is a concept that talks about living smarter, smarter money management, and smarter spending so that you can afford to live the life that you want to live– the life that you dream of living. It unlocks a world of possibilities. Some money saved and invested wisely doesn’t translate into a life of deprivation; it translates into possibilities. It is about determining what you want out of your life, and finding a way to make it happen. Frugal Travelling: Using a smaller car or commuting by bike, arranging a carpool or even using public transport can save you from the expense of maintaining a big car. Walking to work by leaving a little early can also be a healthy and frugal way of travelling. Frugal Exercise: Exercise is important, but it doesn’t have to cost a lot of money. Choose to walk on the beach or join a laughter club instead of getting a membership at a five star gym. Shop Frugal: Stop impulsive online buys. Don’t go to the mall or other shopping areas or stores to look around. Go to a store if you know what you need, and then move out as soon as you finish your purchase. Find other ways to have fun rather than shopping. Eat Frugal: Eat out less. Restaurants are expensive, including fast-food joints. It’s much cheaper to cook your own food. Instead of eating out for lunch, bring lunch to work. If you have to eat out, eat out frugally. Besides making you financially capable of living a life that you dream of living, spending time with family, having conversations with them, reading, going out, and doing things that are fun, focusing on what’s important, and spending your free time the way you want to is also what frugal living is about. This is something you cannot buy. It’s priceless; so value it and start living frugal to avail the maximum benefits.